Tecno P3 dead after flashing with SP Tool or Miracle Box solution. SP Tool DRAM failed 4032 error with Tecno P3 solution. Tecno Y6 power ic solution. Tecno P3 BootData ERR(2) 0_0 with Miracle Box solution. Tecno P3 does power after falling. Tecno phones and android help most Africans to have access to cheap and affordable phones. Most of them come with many functions but the does take the fact out from them that they still need to get somethings fix. Most Tecno Y series and Tecno W series have serious bug of DRAM failed. This may even happen after you use the phone for just like two weeks.Well zamdtek is always here to deal with those tough issues with Phones and PC. Above mentioned issues is common and associated with Tecno android phones. Without much time wasting lets go to the solution. Tecno P3 Self or auto charging. Panel hot and not power solution. 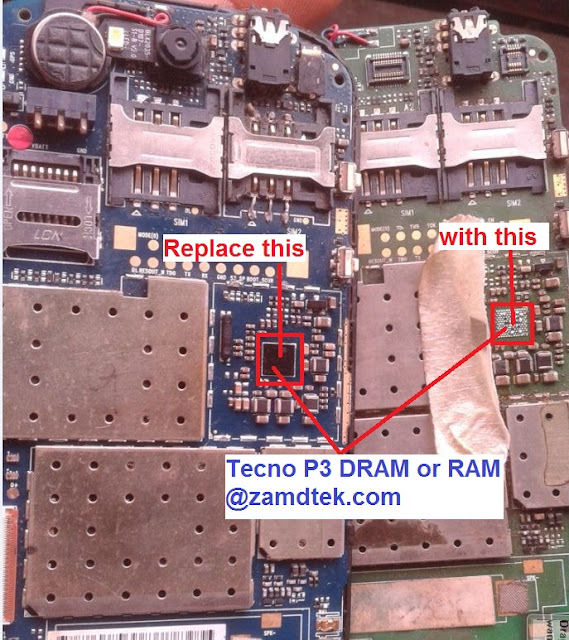 Take apart the Tecno android phone. Open all the covered panel/board. Service and heat the phone board with Rework station. Find and get another Tecno android panel/board. Plug the phone to charger and feel the panel with your hand. Take a look at the picture below to find the location of DRAM phone. The Tecno android DRAM has been indicated so use your Rework and change the RAM. This particular work is done by professional engine or technician. If dont know how to handle Rework Station please don't try this work. But if you are pro with Rework Station then go ahead and change the RAM or DRAM.